The pictures were gut wrenching. This week the chapel at Virginia Theological Seminary burned down and as the story broke, Facebook and Twitter were abuzz with the (heart) breaking news. Fortunately no one was hurt and, of course, the Church is not about buildings — the gospel transcends even the most sacred places. But, still, this kind of devastation and loss hurts. As people of faith we are rooted to sacred space and holy ground. 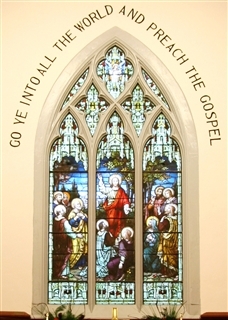 And for many generations of future clergy the chapel at VTS was at the heart of their seminary experience. A place where they sought God; a place of inspiration and prayer and song and hope. A place where they brought questions and sought solace and strength; a place where the soul was laid bare and offered to God in all its humanity. A place where God was made manifest and Jesus was met again and again. And while my initial reaction was “that’s what you get when you let low churchmen play with thuribles,” I also know the pain of losing the spiritual center of a seminary. The transition of my own alma mater, Seabury-Western, away from the residential three-year Master of Divinity program meant that I would never again be able to return to the chapel. I had always dreamed of one day celebrating the holy mysteries at the altar of the chapel of St. John the Divine. And it will never happen. As part of a deal with Northwestern University, the seminary gave the campus back to pay off its debts. The seminary can argue that it is now “leaner and meaner” without such encumbrances but the place will never be the same. They sold their heart. 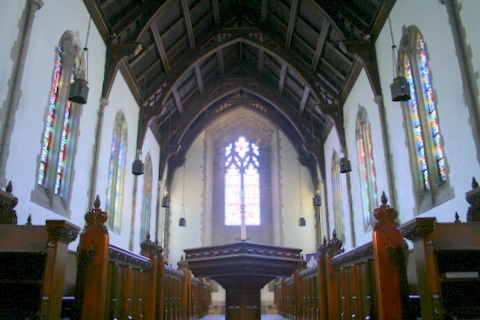 Because make no mistake — the chapel was the true heart of Seabury. It is where we worshipped three times a day, responding to the bells announcing worship like Pavlovian-trained dogs. I have never felt more spiritually rooted and plugged in than I did in the midst of that community. And, though less dramatic than a fire, the loss is no less devastating. Beautiful tribute and remembrance. You reminded me of when I lived a couple of doors down from St. Marks in the Bowery which had a major fire midway through a major renovation. 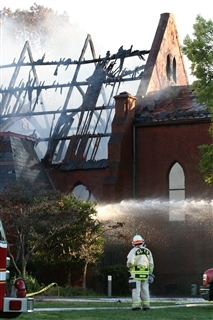 Wasn’t even baptized yet, but I remember standing on the street and weeping as I watched that gorgeous old church burn.